confuse income with wealth. A new generation of household financial managers are hearing from so-called experts in personal financial management due to the proliferation of the cottage industry of financial blogs, podcasts, and the like. In many cases, these outlets are simply experiences shared without science, case studies without data based on broader populations. 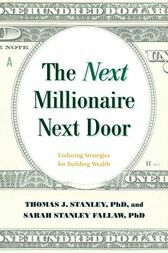 Therefore, the authors decided to take another look at millionaires in the United States to examine what changes could be seen 20 years after the original publication of The Millionaire Next Door. In this book the authors highlight how specific decisions, behaviors, and characteristics align with the discipline of wealth building, covering areas such as consumption, budgeting, careers, investing, and financial management in general. They include results from quantitative studies of wealth as well as case studies of individuals who have been successful in building wealth. They discuss general paths to building wealth on your own, focusing specifically on careers and lifestyles associated with each path, and what it takes to be successful in each. Thomas J. Stanley was an author, lecturer, and researcher who started studying the affluent in 1973. He died in 2015. Sarah Stanley Fallaw, Ph. D. is president of DataPoints, a company that provides assessments based on the research data of her father, Thomas J. Stanley. She lives in Atlanta, Georgia.